Hostel Delta is an attractive and conveniently located hostel catering to business, as well as tourist oriented clientele. 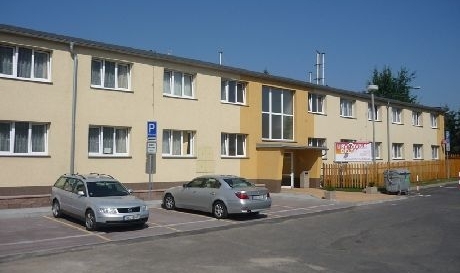 Hostel Delta is located on the outskirts of the City of Chomutov, situated only 20 Km from the German border. Hostel Delta offers ccommodations with exceptional value with its pleasant, comfortable and safe surroundings. Hostel Delta offers affordable pricing, and a little extra’s such as a free Wi-Fi Internet access, or you may use our computer for a small fee. Hostel Delta is situated within close proximity to entertainment, restaurants, shopping, as well as all sorts tourist attractions, such as skiing in the winter, or swimming and water-skiing on our famous Lake Kamencove Jezero, located only short distance from the Hostel Delta. Hostel Delta offers comfortable rooms accommodating two to three guests per room. All rooms are furnished with color TV, refrigerator, and WC. Separate showers are conveniently located on each floor, as well as a fully furnished kitchen with modern appliances, dishes and utensils.